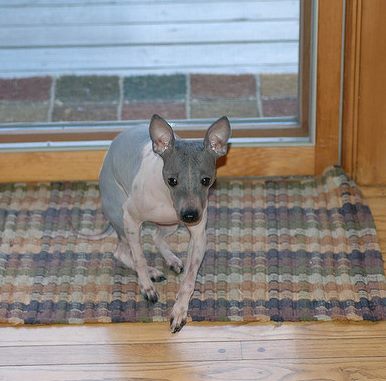 The American Hairless Terrier began back in 1972 when a little hairless puppy was born into a litter of Rat Terriers. Since then they have been recognized as a separate breed and over the years, they have developed many characteristics that distinguish them from their origins. They are smaller, have new eye colors, new patterns and lack hair, all traits that make them a unique breed from the Rat Terrier. 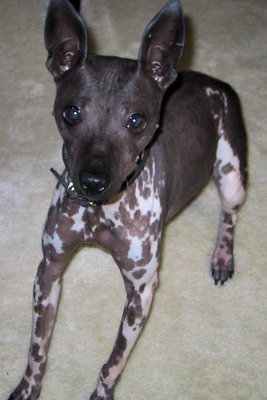 These hairless dogs further differ because breeders have chosen to promote the undocked tail appearance, distinct from the docked tail of the Rat Terrier. 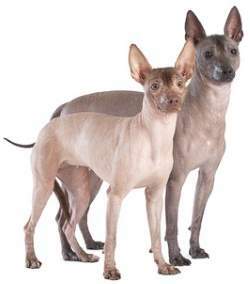 One might think that the American Hairless is related somehow to other hairless dogs in the world. One important factor differentiate them from all others. The gene that causes the hairlessness in the AHT is recessive. All other hairless breeds can credit their lack of hair on a dominant gene. These dogs are hairless with the exception of eyebrows and whiskers. Puppies are born with a light fuzzy coat which they gradually loose between eight and 12 weeks of age. They have deep chests, strong shoulders and powerful legs. They hold their ears erect which is preferred, but some also have ears that bend slightly at the tips, called Tipped or at the base, called Button. They are an active breed but can do well in the city and in an apartment provided they get a daily walk to use up some of their energy. They can never be left outdoors—they are strictly an indoor breed. Their size makes them an ideal lap dog. If you are an allergy sufferer, this might be the breed for you. Although no dog is completely hypoallergenic, they come close. 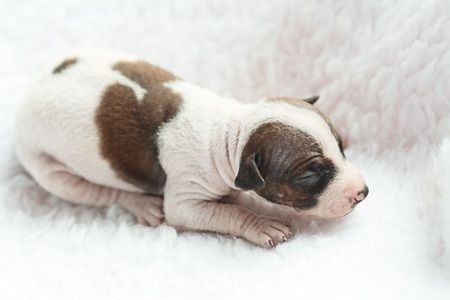 Colors: White with a variety of colors and patterns that include near solid, brindle, piebald and saddled; Skin Colors can range from black, blue, pink, brown, tan, and stable; lighter colored dogs may develop a tan in the sun darkening the skin tone. Albino and Merle are not accepted. Good with Children: Due to their small size, caution is advised; Many breeders will not sell their small puppies to families with small children. Good with other pets: Due to their strong prey drive, caution is advised around small pets such as hamsters or gerbils. 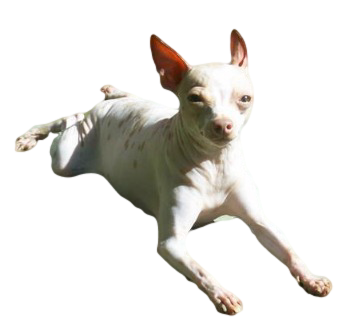 The breed is a relatively recent addition to the world of dogs, beginning in 1972 when a hairless puppy was born into a litter of Rat Terriers, making it a natural mutation. The owners, Edwin and Willie Scott named her Josephine and raised her, then bred her hoping to produce another hairless. Eventually they succeeded and in 1981 produced the foundation stock that would later become a distinct breed. 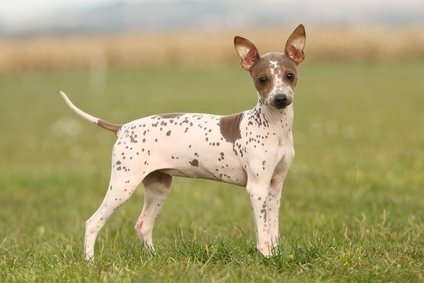 In 1998, the American Rare Breeds Association recognized these dogs as a distinct breed from the original Rat Terrier Breed and named the dog the American Hairless Terrier (AHT). Soon after, the Canadian Rarities recognized the breed in 1999, followed by the United Kennel Club in the US in 2004. Now, the American Kennel Club has recognized the American Hairless in their Foundation Stock. 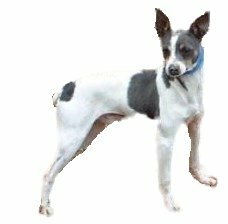 Since the breed is so new, it is permissible to use some Rat Terriers in breeding programs to assure that the gene pool remains healthy and prevent too much interbreeding. The AHT is a lively, curious and intelligent breed, sporting a strong athletic body. They originated in a Rat Terrier litter, but to truly understand their personality, it is important to know that the Rat Terrier was developed from breeding a mixture of different dogs. 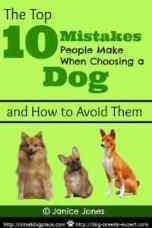 This mix included the European Terrier breed named Feists, the Beagle, Italian Greyhound and Miniature Pincher. This mix makes them pure terrier, through and through. As with other terrier breeds, they are lively, feisty, fearless, but eager to please. They enjoy digging, chasing prey, and taking long walks. Even though they are a terrier, they should not be used for hunting because they lack the harsh protective coat that protects other terrier breeds from the elements as well as objects in the terrain. They need about 30 minutes per day of active exercise, some of which they can get indoors. They can excel in agility, do well as a watch dog, seem to enjoy water, but they are not good swimmers. 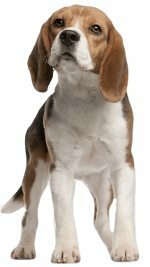 These dogs need daily exercise and they can develop behavioral problems if they don’t have an adequate outlet for their excess energy. These dogs are a breeze to groom. They need to be kept warm in the winter months and protected from the sun in the summer. Some suffer from dry skin, so a little lotion can be applied. Bathing should be done regularly to keep their skin healthy. Their nails will need to be trimmed about every two weeks and ears should be checked and cleaned as needed. As with any dog breed, their teeth should be brushed regularly. 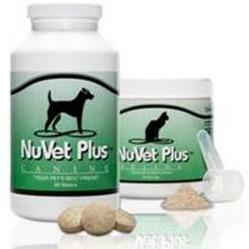 They are a healthy breed that has been spared some of the major health concerns of other hairless breeds. Due to their hairless nature, their skin needs to be protected from the sun. These dogs may need to be dressed in a shirt when outdoors or sunscreen applied. In cooler climates, they will need a sweater or coat. Sometimes they can get a rash on their skin due to allergies, especially grass allergies. According to the American Hairless Terrier Club of America, these disease have been reported at least once in this breed. Keep in mind, all dog breeds suffer from diseases, may genetic and though they are listed below, it does mean that they are prominent in the breed. The list below includes all diseases that owners and breeders of the American Hairless Terrier have taken the time to report. Not all breeds are so well represented!